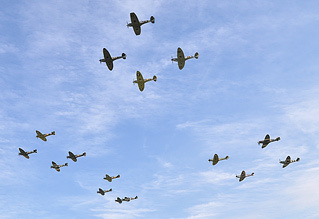 One of the most anticipated events in the 2010 display calendar was the Battle of Britain Airshow at Duxford, and more particularly the intended sixteen aircraft Spitfire formation. 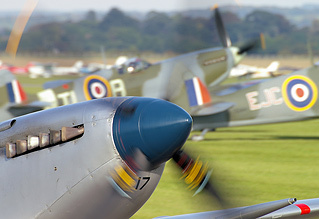 More Spitfires have been seen in the same airspace in the past, and of course large formations of warbirds are a common sight at the Legends shows held on the same airfield, but in this seventieth anniversary of the Battle the promised close formation would be a unique and special occurrence. Phil Whalley re-visited the show two years on from his first taste. Ian Matthews provides additional photos. For many of the visitors who managed to get into the crammed museum airfield, the show's headline act will have been one of the most awe inspiring sights they will have ever seen at an air display. Taking place in the late afternoon of each day of the weekend, the Spitfire flypast was the focus of everyone's attention, with all else being but support acts. This is of course in no way meant as a criticism of the rest of the day's activities, for that would be a huge injustice, but more intended to illustrate just how special the spectacle was. Not just for the formation flypast either, but for its build-up, and the insane tail-chasing that followed. Clearly the general public had got wind of something not to be missed, as the roads surrounding Duxford on the Saturday were soon at a standstill, and the car parks filled to capacity with the gates having to be locked. Final head counts indicated a crowd of 24,000 for the Saturday, with 20,000 attending on the Sunday. Those arriving early weren't just rewarded by being able to get in, but also by enjoying the best weather of either day. Both days began with warm blue skies with wispy clouds. A great backdrop for photographing the flightline, though neither day held for the flying display. Thankfully Sunday eventually broke into something half decent, as the show badly needed to be seen in weather able to do it justice. And so to the flightline. I know that static aircraft aren't to everyone's taste, but gazing upon such a fine line of classic warbirds, well lit, with little clutter, is a dream for many. Throw in some re-enactors, and late arriving aircraft taxiing in and you can just hear the memory cards filling to bursting point. Two Buchons parked next to each other, a rare sight indeed, a couple of Spitfires in new paint schemes and others seldom seen were first to catch the eye, but even being able to spend some quality time in great light with regulars like P-51s 'Ferocious Frankie' and 'Miss Velma' is a pleasure rarely tasted. On the Saturday the flying started earlier than usual, with the Red Arrows requiring an early slot to facilitate their onward travel to display at the Northern Ireland International Airshow, at Portrush. Sadly by the time the Reds arrived each day the clouds had moved in, and would remain throughout the day on the Saturday. The Reds also had to leave a Hawk behind at Cambridge, thanks to a young visitor setting off the engine fire extinguisher shortly before their departure time. As the main display commenced, it was good to see The Fighter Collection's Bearcat back in the air again, with Pete Kynsey producing a very impressive routine, and sharing the airspace with TFC boss Stephen Grey in his Sea Fury T.20. 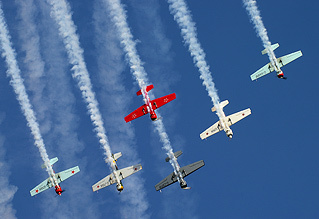 A pair of home-based silver Harvards flown by Anna Walker and John Dodd included some tight pairs formations. Other Duxford residents that made appearances were the ever popular Sally B, the 'Miller' Rapide, and Plane Sailing's Catalina. 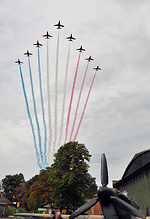 Visitors included the Battle of Britain Memorial Flight, Aerostars, and the Patrouille de France, who closed the show on the Saturday to much acclaim. Although the Sunday enjoyed the brighter weather, it suffered from stronger winds, bringing about a most unusual sight of some of the lighter aircraft using an apparent cross runway, launching into wind from the grass field at what I would guess was roughly forty-five degrees in deviation from the hard runway. This included two Moths, a Leopard and a Hornet, which also had to make equally interesting landings. The show wasn't just all about warbirds and classics, as ears had the chance to ring to the crackle of re-heat from the RAF Typhoon and the Belgian Air Component's F-16 'Viper'. Cdt 'Mitch' Beulen in the Fighting Falcon took the plaudits for the more dynamic display. 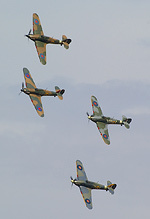 The day's main commemorative theme focused on three feature formations, starting with four Hurricanes. The examples owned by the Historic Aircraft Collection, Peter Vacher, the Shuttleworth Collection, and Peter Teichmann in the Hangar 11 machine made a number of passes and turns in a diamond formation, followed by a tailchase, which included a once again vastly outnumbered Buchon! There then came the main set-piece of the day. 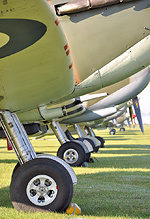 Four Hawk T.1s (three on Sunday) and a T.2 from the current 19 Squadron - the first squadron to operate Spitfires, and from this same airfield – earlier passed through in a 'vic' formation, and then returned to open the memorial piece. One Hawk pulling up into the 'missing man' formation signalled the start of a minutes silence in honour of 'The Few'. As that minute ticked towards its end, approaching from the right came the awesome sight of sixteen of Supermarine's finest, in four boxes of four, thundering across the hallowed turf of Duxford much as they would have seventy years ago, perhaps with Douglas Bader himself leading. Once the 'Big Wing' had passed through, and the welcome applause from the large audience had subsided, you could have been excused for thinking that that was that. There was no indication that all hell was about to break loose. First the formation separated into the sum of its parts, and then further broke into line astern, with eight Spitfires turning away from the crowd-line, six behind, and a pair going high. Each tail-chasing group then passed in front of the enthralled public simultaneously, with the high flying pair also looping through, in and out. No camera could possibly capture the action. Everybody gave it a good go I'm sure. You had to really, just to have something of this remarkable experience saved for posterity. There's no doubting that what was witnessed was an all-time great in the history of air displays. People will talk about it for many, many years, and those that were there will remember it forever, as, I hope, they will the reason for which it was organised. By remembering this event, we remember 'The Few'.